Yusef Casanova believes he has enough evidence to prove federal law enforcement targeted him because he’s black. Casanova, whose case NMID highlighted in a May 2017 investigation, is asking a federal judge to drop federal drug and gun charges from a controversial monthslong 2016 sting operation in Albuquerque and give him his freedom back. The motion, filed last month in federal court, contends there is evidence that shows agents and informants of the federal Bureau of Alcohol, Tobacco, Firearms and Explosives (ATF) racially profiled Casanova and other African Americans in the operation. Casanova sold an ounce of meth and a gun to an undercover ATF agent in June 2016; he was arrested weeks later and has been locked up pending trial ever since. His white supplier — who was present when Casanova brokered the drug sale — was never arrested. Casanova and a handful of black suspects have raised that situation and others like it to claim “selective enforcement” — a legal term for racial profiling — in an effort to pry loose additional information from federal prosecutors. The judge in Casanova’s case granted that request and the information gleaned from Casanova’s legal victory — and others won by defendants in other sting cases — led his lawyer, Assistant Federal Public Defender Brian Pori, to file the motion seeking a dismissal of charges stemming from the sting. The U.S. Attorney’s Office did not respond to a request for comment on this story, but prosecutors have indicated in court filings that they plan to oppose Pori’s motion. Their deadline to do so formally is Thursday. A hearing before Senior U.S. District Judge James Parker, scheduled for Sept. 17, sets up the most significant showdown yet over whether the ATF illegally picked targets in the operation based on their race. Of those arrested, 28 — 27 percent — were black, an analysis by New Mexico In Depth found. That’s compared to Albuquerque’s overall black population of 3 percent. Further, black people made up just 5 percent of gun and drug defendants in New Mexico federal court cases between 2006 and 2015. Federal agents and prosecutors have said repeatedly in court filings that there was no racial bias at the heart of the operation. Rather, they said they went after and arrested the “worst of the worst” in a city beset by crime in recent years in an effort to help resource-strapped local authorities clean up the streets. Defense lawyers and a yearlong analysis by NMID have challenged those claims, however, pointing out that ATF agents overwhelmingly arrested low-level people struggling with drug addiction — some of them, like Casanova, even living in their cars — as opposed to the hardened dealers they said they were after. In his motion to dismiss Casanova’s charges, Pori wrote that agents considered 225 people for potential arrest — including Hispanics at a rate roughly parallel to the city’s Hispanic population. But whites were significantly underrepresented by population among those investigated, and blacks were heavily overrepresented. Moreover, in cases in which a higher-level dealer was identified, whites were the source of supply in more cases than blacks. But “when it came time for the ATF Agents to actually exercise their discretion in selecting potential brokers to be targeted, black people were once again dramatically over-represented in the ATF enforcement efforts,” the motion says. In Casanova’s case, even though “John” — his white supplier — “was the most culpable individual encountered by the ATF Agents during the charged criminal offense, John was not subjected to nearly the same level of scrutiny and investigation as the black men who preceded him and, unlike Mr. Casanova, he was never charged with a crime,” according to the motion. Conversely, black people who simply brokered low-level deals were far more likely to be arrested than whites. Pori told NMID his office is still confirming the specific numbers he cited in his motion. In the court document, Pori traced what he called the roots of systemic racism in America’s criminal justice and other systems. He cited the U.S. Supreme Court’s infamous 1857 “Dred Scott” decision, which states, in part that “the enslaved African race were not intended to to be included and formed no part of the people who framed and adopted” the Declaration of Independence. In that case, the high court held that black people could not be U.S. citizens and therefore had no standing to sue in court. Pori pointed to other seminal cases and studies that show black people have been disproportionately targeted for arrest and incarceration in America down through the decades. He also criticized the design of the ATF’s Albuquerque operation — specifically that agents relied heavily on black confidential informants to identify targets for arrest and appeared to have no written plan for the operation — and tied it to what he called a history of racism in the U.S. justice system. The longtime public defender acknowledged the incredibly high bar of proving racial profiling in court — he must show that ATF’s actions had a “discriminatory intent and effect” on Casanova. Such claims are seldom won in federal court. Casanova faces decades in prison if convicted. The secret filing means the public cannot view — or scrutinize — the U.S. Attorney’s defense of Yusef Casanova’s arrest, which federal public defender Brian Pori has challenged. 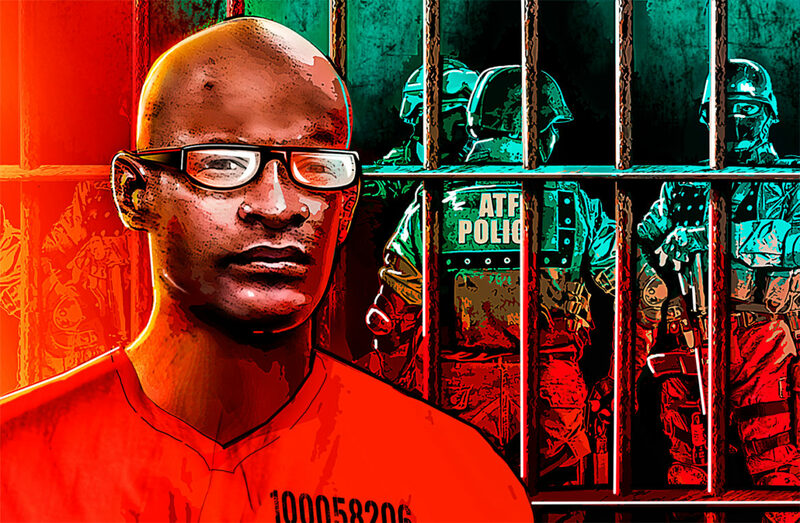 Last month Pori argued in a motion that he had enough evidence to prove ATF agents and informants targeted Casanova because he’s black and asked Senior U.S. District Judge James Parker to drop methamphetamine trafficking and illegal firearm possession charges. But Pori told NMID the government did not need to name people who had been identified for investigation but not arrested. Prosecutors could’ve blacked the names out of the document, but left its defense of Casanova’s arrest for the public to see, he noted.